Steam 'Early Access' users will receive this update Monday, December 18th, 2017. Xbox 'Play Anywhere' players can also expect this patch to hit their consoles or Windows 10 machines Monday, December 18th, 2017. 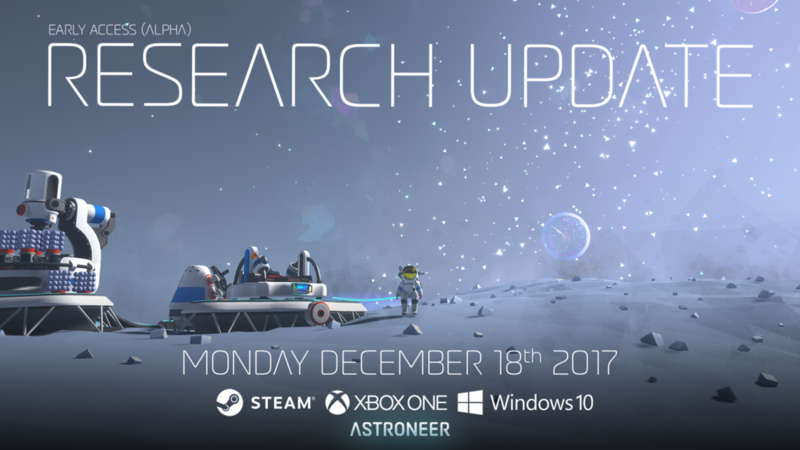 The Research Update is an entirely new way to play Astroneer. As part of our Alpha launch, we wanted to lay a solid foundation by updating our core game loop. Now, using the new Catalog and Research Chamber, players can use Bytes to unlock the blueprints they want. This update also includes our first module that uses "streaming power", as well as changes to resource colors and some under the hood performance changes while we continue our ongoing effort to improve game stability. Also, as mentioned earlier, we are moving into the Alpha phase of development, which means that going forward, we will be adding content and changes to the game with every update until we reach Beta. For a list of upcoming features and expected launch windows, check the roadmap update below! You can find these updates in 0.5.0.0, the current build of the game. 1. We have introduced a concept called Bytes. 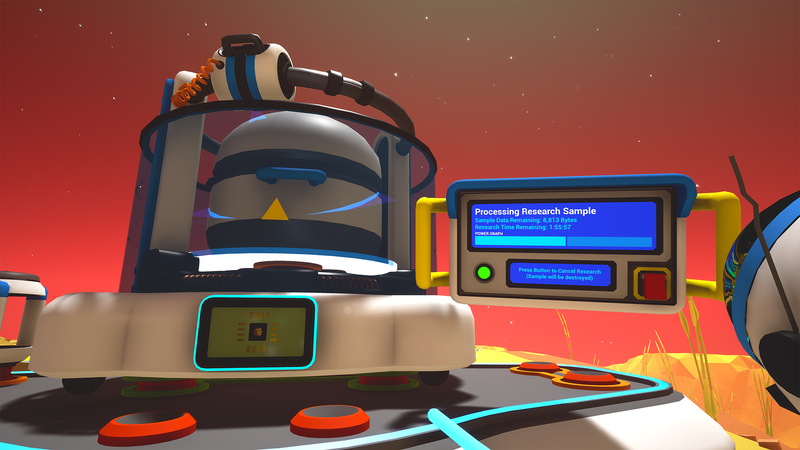 Bytes are the way Astroneers will unlock items in the new research system. 2. Getting Bytes requires researching items at the new Research Chamber. Items that are researchable include: Research Chests found in the world, and resources like Compound, Resin, etc. We will be expanding the list of researchable items in the future. 3. Use the backpack Catalog to unlock blueprints. After you have accumulated enough bytes to unlock the items you want, open up your Catalog in your backpack to send data to Exo Dynamics in exchange for the blueprint to create said item. There are a few general tips for this new system. Research Chambers require a constant flow of power to continue gathering Bytes. That means power infrastructure like Batteries, Generators, Solar panels, and Wind generators will become extremely important. You can Overclock your platforms to produce more bytes by increasing the amount of power the platforms receive. The new Research Chamber is our first platform using "streaming" power, a system we are going to move to completely in the future. Now, rather than placing a research chest on the platform and getting a random item, you research objects to accumulate data, which you can then use to unlock whatever items you would like from your backpack. These platforms all stack, so the more powered platforms with research you have going, the more Bytes you will accumulate! You can also Overclock your Research Chamber to accumulate Bytes faster. Examine the module connected to the platform to see the rate of Bytes, and also check if you are operating at maximum efficiency. Players should also be aware that after you add a researchable item to the Chamber, you cannot stop the process without destroying the contents. Cancelling for any reason means you lose the Bytes left in that subject! The Catalog is your central hub for unlocking printable blueprints for items. Once you have enough Bytes, open the catalog using the backpack key while the backpack is open, or just click on it when your backpack is stowed. On the top if it's screen you will see the rate of Bytes Per Minute (BPM) as well as your total accumulated Bytes, and on the bottom, you can scroll through researchable items and unlock them by clicking on the green button. To cycle through the categories of research, press the buttons with the icons above the main window. As the first step in getting basebuilding online, the Research Chamber uses the new streaming power system to operate. That means rather than having base modules use a power bar that has to continue refilling, modules using the new mechanic search the network for sources of power and then stay connected to them as long as the power keeps coming in. Keeping with our ideal to try and base items in our game on actual science, we worked on updating resource colors. Items like malachite should now better reflect their real world counterparts. These are still a work in progress. The game now has a few usability and informational tweaks. The first is a prompt to let players know that an old save is most likely unsupported and buggy. Upon loading the older save, the game will warn you about the potential for bugs and less than ideal performance. We also added a new message of the day area on the home screen, with a link to patch notes so you can check them out anytime. Players will now have an on-screen prompt upon starting new saves that explains updated mechanics and content! Press F1 on your keyboard or the "View" button on your controller to pull up these tutorials at any time. Now, if you crash as a result of a bug, the game will automatically send a report to us for triage. We might still ask for crashdumps from time to time, but this will help us better track crashes and how many players they effect. 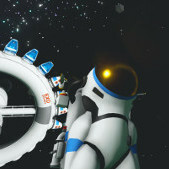 Purchasers of the Astroneer soundtrack will get the new Soundtrack Volume 2 by Rutger Zuydervelt for free! If you want to purchase a physical copy, head over here! Riley also added new sounds for the Research Chamber and Catalog. If you want to see the other stuff that happened this month that didn't make it, check out our vlogs for weekly insight to what the team is doing. This month the team showed off some new hazard behaviors that you should be seeing in game really soon. [AS-1308] - The game now auto-saves appropriately when force quitting via the window “x” in the top right corner or by pressing ALT+F4. [AS-1713] - Fixed a visual issue where Client player’s dropship had no thrusters in Multiplayer games. 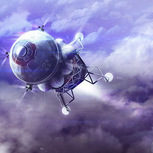 [AS-1762] - Players can no longer hold objects after death or during the re-launch animation from orbit. [AS-1816] - Fixed a few issues with quick stowing of items not interacting well with the backpack printer. [AS-1829] - Fixed the Terrain Brush color ring to reflect the player color in the 'tool disabled' state (it’s no longer fuschia). [AS-1832] - Fixed a few other instances of Client players getting stuck in a wheelie while driving a Rover in Multiplayer games. We are currently working diligently with a 3rd party to start standing up the dedicated server experience. There are unanswered questions regarding ownership & persistence, but we expect to be shipping our first dedicated server experience during Q2 of 2018. 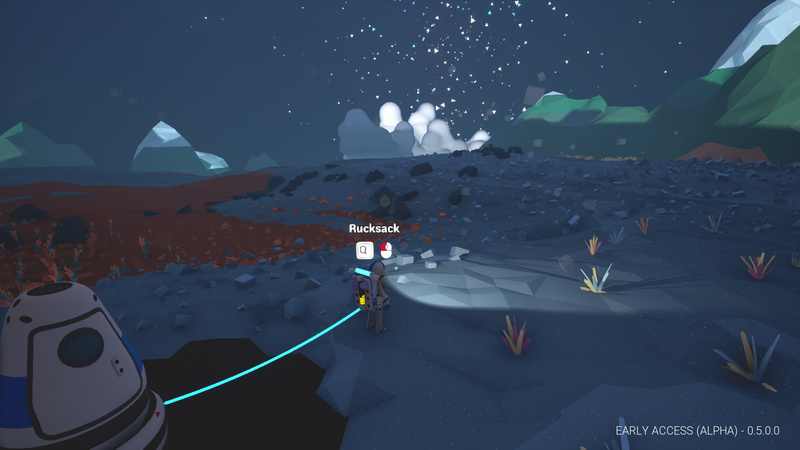 Right now the team is working on some elements that will will completely change how you build your bases, and creating "tiers" of base modules that will scale up as your Astroneer starts to master the solar system. We want there to be a sense of progression when creating bases, so that your initial base looks way different than a base belonging to a seasoned Astro. That doesn't just mean bigger, that means more complex, but also more rewarding. Right now you could technically burn organic on 30 small generators to power a big base, but what if you could just upgrade your base with more powerful and automated power sources to replace them all? The initial version of basebuilding will be shipping some time in Q1 2018. The first version of this is out, but that doesn't mean we are done. As with all of the new systems we are shipping, these are just base implementations that we will now work on expanding. The next steps include working on items that instantly grant you research points, and unlockable blueprints that can only be found out in the world and never be unlocked via the catalog. Expect this to keep getting more content for our next few updates. As a part of Terrain 2.0 we will also be introducing an entirely new weather and hazard system to challenge players. You should have gotten a taste of this in last weeks vlog. Rather than just being challenged by gas bags and dust storms, we are going to implement different kinds of weather effects, and aggressive flora that will challenge your exploration of the solar system. I will save you the technical talk and just say that creating new planets, biomes and caves has begun. There is still a long process to tweak the procedural system, but T2.0 is slowly being turned over from engineering to the art team so they can begin making much more complex planets with unique challenges to face. Holy hell this was a long one. Thanks to everyone who has been sharing, reporting bugs, and providing feedback on the current state of Astroneer and keep the info coming in so we can make it the best game it can possibly be! Looking forward to continue updating the game on a regular basis! Umm, Joe... why does it say you posted this on November 13th? And Joe, while you're there, whisper in the artist's ear that magenta text on blue background is a no-no. Its realistic! The box went true a crash landing. I guess the display broke. I have to say that this research 2.0 is looking promising. It did take a while to get going, I figure it took me an hour just to get my first solar panel built but after that, it really accelerated greatly, especially when you got 5 research stations running at once. 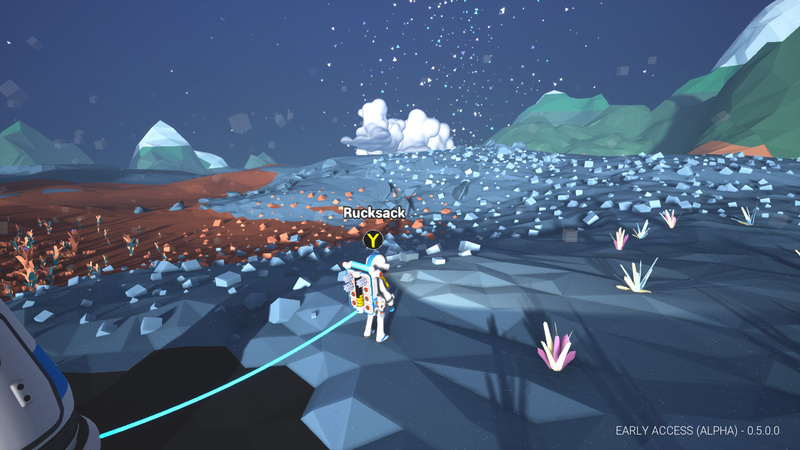 I can't see this working too well on other planets because of the limitations of resources in the areas where you land. This could be solved by giving us the tether first before the small generator, at least you be able to extend your range. The problem that I've notice so far, is that once you find out which chest has the best bang for bytes, you won't waste your time on the other chests. Perhaps the solution to this, would be to have different kinds of research points, so like the common chest would give you certain kind of points and the exotic chest would give you another kind of research points. So when you're unlocking recipes, it would require certain amount of points from the different kinds of research you've collected. This way, all the other chests won't be neglected. I just about forgot, I was kind of disappointed when I couldn't research the zebra ball. Well well you guys have done it, you have created an update that has got me excited to go see the changes. this is a game changer, god no more running for hours just to keep receiving the same blueprint. i will finally fell like im progressing towards something rather then being let down when when opening up research to only find out its something i already had. Now i get to build towards what i need. fan-freaking-tastic. only problem with all this is, is that im at work and cant hop on and try it right now!!!!! This makes a great point, we as gamers find this stuff out quickly and he has already found the research chest that is going to wield him the most points that means that. that specific chest will be the only chest we will use leaving the other chest undesirable. the way to make this fun with all chest is doing exactly what he said make certain research require low grade + legendary + exotic research points to craft forcing us to cherish all chest. please look at that. dont make the more research point chest harder to find just update the research to require different kinds of research points making us have a need for all the chest we come across. Of course, the downside is I just finished building a massive multi-level base on Exotic in my current save. Oh well, back to the start! This is exciting! I can't way to jump in and give it a go. The best way to offset having chests of different values is to make them harder to find, so that the player can't rely on only the most valuable ones. In fact, with the dynamic they're introducing of research bytes being "lost" if the research is stopped, I think that makes the lower byte chests more valuable. Think about it. If you have a high-value chest in there and your power runs short, you just lost a lot of research points. But if it's a lower-value chest, then you might not lose as much. And you can reach the same overall totals by hauling back a ton of smaller chests and just researching them one after the other. There's no need to over-complicate the point system. I cannot map any of the keyboard control settings to my mouse (Logitech G400s), when I try nothing happens. Custom control mapping only works for keyboard. 4k resolution still unsupported on PC. How should I remove the bagpack tooltip message from my player? I click Q to open the backpack and left mouse but it won't go away. It's really annoying. Maybe I miss something. Doesn't work either. Looks more like a console tooltip but I don't even have a controller attached, just mouse and keyboard. It's a tutorial. Follow the tools tips. It actually is supported, the settings just don't save for some. I have to build something from the backpack, it goes away then. Custom keyboard settings are not saved properly by the way, after a restart it goes back to default. Great new content in the update, folks! I'm just getting started so I'll most more feedback as I find things, but here's the first one. Can we keep the normal behavior toggling between (1) and (2) and only access the catalog module (3) when desired by clicking on that part of the backpack? I understand that by including it in the default loop cycle people can't help but discover it and its uses, but I think you could raise awareness of it's use with tutorial style pop-up tips instead. Lot's of great stuff in here too, just haven't gotten to reviewing that yet .